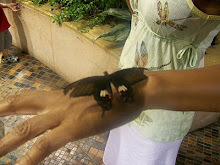 Free Spirit Butterfly: What's your dream job? When I'm feeling blue, I imagine myself: Retreating to a sacred space. I need quiet time to reflect and to hear from Him. My personality would be summed as: Simplistic, youthful and free spirited. No make up...no jewelry...no fuss and no drama. I wish I understood why: People give up so easily...seriously, grow up. Can we just be in-love and not sweat the small stuff? I always get stressed out by: An obsessive amount of work related e-mails and last minute demands with a due date of yesterday or ASAP...really, how important is it? I'm often puzzled by: Kids who disrespect their parents, people who begin eating without saying grace and those who don't say please and thank you. The best thing you can do for any relationship: Speak the truth with love and accept the person for who they are. If you want something different, then you should have chosen someone different. Love for a great day! Running my own Real Estate business as broker\owner and make lots of $ (be debt free) so I can take care lots of orphaned\homeless children. My heart aches when I see them on TV and I thank God that He has given me so much and I am not any better than them. Grace. Take beautiful\stunning professional pictures with my SLR camera. When I'm feeling blue, I imagine myself: as a child again. I had a very happy kidhood full of adventure & loads of bright, curious friends, & I remember when good times were free & laughing came so easily. I miss the sound of my youthful laughter & the simplicity of just being a kid. My Dream Job would involve: Running a magazine (something in the vein of Essence... but for Men) writing on a regular basis, contributing to the editorial vision where I could inform, direct & hopefully inspire others in the ways of living well & leading a more beautiful, meaningful & spiritually-based existence. I told my kids, that he's their stepbrother. We have an abundance of "stuff" it's the least we can do for him and for Him. I pray that the Father will help you in your dream job and that many, many children will be blessed by your gifts. I love your response. How strange that all of my "happy" memories vanished once my stepdad came into our bedroom when I was in the 7th grade and announced that he and my mom were getting a divorce. Prior to that moment, I truly believed we were the luckiest family in the world. In my "mind" we were happy, deeply loved and rich. When your dream job becomes a reality, I'd love to have a small role in helping you with your vision. I love people with a vision. Each one teach one! I, too, sponsor a little boy through Compassion from my native country Haiti. His name is Samuel and I wanted to name my firstborn Samuel. But his dad objected stating they had a dog (on his side of the family) name Samuel. And Sunny is such a beautiful name.